Click the "File" menu label at the top of the main window. The File menu provides commands for creating new items, adding shared calendars, importing or exporting, printing, and backing or restoring data. The New menu option expands into a submenu of commands for creating new items. After selecting this command, a new event calendar will be created. The Calendar Properties window will be displayed. The calendar will also be added to the Calendar List. Event calendars are associated with events, meetings, and appointments. You could define multiple event calendars for birthdays, anniversaries, work schedules, medical appointments, scheduling rooms or other resources, etc. The default keyboard shortcut is Ctrl+Shift+C. After selecting this command, a new task calendar will be created. The Task Calendar Properties window will be displayed. The calendar will also be added to the Calendar List. Task calendars are associated with task items. You could define multiple task calendars for keeping track of different types of tasks, such as household tasks, work tasks, etc. After selecting this command, a new note calendar will be created. The Note Calendar Properties window will be displayed. The calendar will also be added to the Calendar List. Note calendars are associated with note items. You could define multiple note calendars for keeping track of different types of notes, such as daily journal entries, grocery lists, recipes, memory aids, etc. This command will create a new calendar shared over your local network. If this is your first shared calendar, you may be prompted to select the local server. Instructions for configuring VueMinder Server can be found here. By default, all users on the local network will have read-only access to the shared calendar. 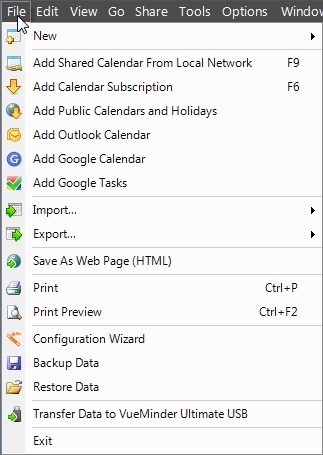 This can be changed on the Sharing tab of the Calendar Properties window, which will be displayed after selecting the Shared Calendar menu command. The Calendar List enables calendars to be grouped. This command will create a new calendar group in the Calendar List. Existing calendars can be dragged into the new calendar group, or the group can be right-clicked to add new calendars to it. This command will create a new category, which can be used in the Category field of the Event Editor and Task Editor windows. The new category will be displayed in the Category Editor, where the default name and appearance can be modified. After selecting this command, the Event Editor window will be displayed, where a new event can be defined. The default keyboard shortcut is Ctrl+N. After selecting this command, the Recurrence tab of the Event Editor window will be displayed, where a new recurring event can be defined. This is the same as the "New Event" command, except the new event will default to be recurring. After selecting this command, the Event Editor window will be displayed, where a new all-day event can be defined. This is the same as the "New Event" command, except the new event will default to being all-day. After selecting this command, a Select Contact(s) window will appear, where one or more contacts can be selected for linking to a new event. After selecting a contact, the Event Editor window will appear, enabling the details of the event to be entered. The associated contact(s) will be listed on the Links tab. This command will initiate a new meeting request. The Attendees tab of the Event Editor window will be displayed, where contacts, distribution lists, or groups of contacts can be selected. After the meeting request has been defined, it will be sent via email to the selected attendees. If the meeting request is later changed or deleted, an updated email can be sent to the same recipients. After selecting this command, the Task Editor window will be displayed, where a new task can be defined. Tasks are displayed in the Task List. The default keyboard shortcut is Ctrl+Shift+T. This command will cause the Note Editor window to be displayed, where a new note can be written. The note will default to being pinned to the first date selected in the Calendar View or Navigation Pane. The default keyboard shortcut is Ctrl+Shift+N. This command will cause the Contact Editor window to be displayed, where a new contact can be defined. The new contact's File As value must be unique, otherwise the changes will overwrite the existing contact having the same File As value. Contacts can be selected as recipients for email reminders, text message reminders, and meeting requests. They can also be added to distribution lists. This command will cause the Distribution List Editor window to be displayed, where contacts can be added to a new distribution list. Distribution lists can be selected for email reminders, text message reminders, and meeting requests. Select this command to add an existing shared calendar to the Calendar List. The Add Shared Calendar window will be displayed, listing all shared calendars available on the local network to which you have reader, contributor, or owner access. 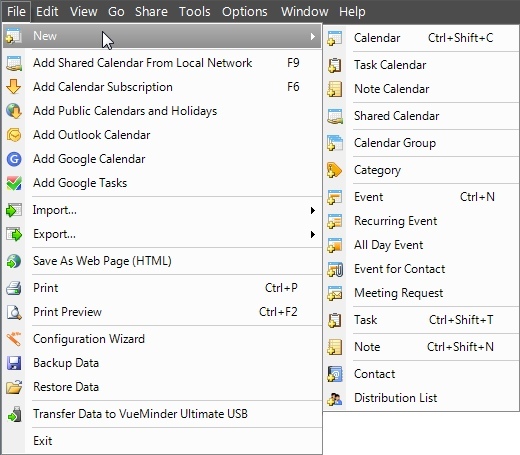 If you haven't configured calendar sharing over your local network, no calendars will be listed. The default keyboard shortcut is F9. This will initiate a new ICS calendar subscription. A new calendar will be created and added to the Calendar List. The Subscribe tab of the Calendar Properties window will then be displayed, enabling the location of the calendar to be specified, along with other subscription settings. If the new calendar is successfully subscribed, it will automatically be named based on the source calendar. The default keyboard shortcut is F6. After selecting this command, the Add Public Calendars window will be displayed, enabling you to browse a list of publicly available calendars and select ones that you would like to add to your Calendar List. These public calendars cover things like holidays for a variety of countries and religions, sports and entertainment events, local weather, science and astronomy events, and much more. Depending on the selection, the Import Events, Import Tasks, Import Notes, or Import Contacts window will be displayed. Data can be imported from a variety of sources, such as ICS files, CSV and tab-delimited text files, Microsoft Outlook and Excel, etc. Depending on the selection, the Export Events, Export Tasks, Export Notes, or Export Contacts window will be displayed. Data can be exported to a variety of destinations, such as ICS files, CSV files, Microsoft Outlook and Excel, etc. This command will display the Save As Web Page window, where one or more months can be saved to HTML web pages. Any filters set in the Calendar Items area will be used when generating the web pages. If there are calendars you don't want to include in the HTML output, you can uncheck their names to cause them to be hidden, prior to using the Save As Web Page command. The generated web pages can be uploaded to a website. This command will display the Print Settings window, where a print layout, date range, and various options can be specified. A dynamic print preview can also be displayed. It will automatically update as print settings are changed. After you're satisfied with the print settings, you can continue printing from the Print Settings window. The default keyboard shortcut is Ctrl+P. This is basically the same as the Print command, except the dynamic print preview window will automatically appear. The default keyboard shortcut is Ctrl+F2. This command will display the Configuration Wizard, which helps guide you through setting up VueMinder for initial use. This wizard is run automatically the first time VueMinder is commanded, but can be accessed at any time through the File menu. This command will display the Backup Data window, where you can adjust the automatic backup settings, see a list of previous backup checkpoints, and manually generate a backup. This command will display the Restore Data window, where you can restore from a previous checkpoint or browse for a manually generated backup. This command enables the current data to be transferred to the USB version of VueMinder. The Transfer Data to VueMinder USB window will appear, where the location of the USB version be specified and the data transferred. The USB version has a similar command for transferring data back to the installed version on the local computer, enabling easy data synchronization between the regular and USB versions. If you don't already own the USB version, but you do own the regular Pro or Ultimate version, you'll be eligible to receive a substantial discount on the USB version. This will minimize the VueMinder window to the Task Tray, unless the Program Option has been set to fully exit the program when the main window is closed. Note that VueMinder will continue to run in the background, so that reminders for approaching events can be displayed, sent via email, or to your cell phone as needed. While running in the background, minimal system resources are used. An icon will be displayed in the Task Tray of the Windows taskbar when VueMinder is running. The icon will show the current date and can be right-clicked to access a number of quick commands.